Four short weeks ago i gave birth to my beautiful son Joseph. I already love him more than words can possible express but if truth be told he does not currently do a lot other than sleep and eat. I am off on maternity leave and although Joe has a talent for demanding my attention at regular intervals during the day it has become apparent that I need a few hobbies to prevent me totally losing the plot during the coming year. 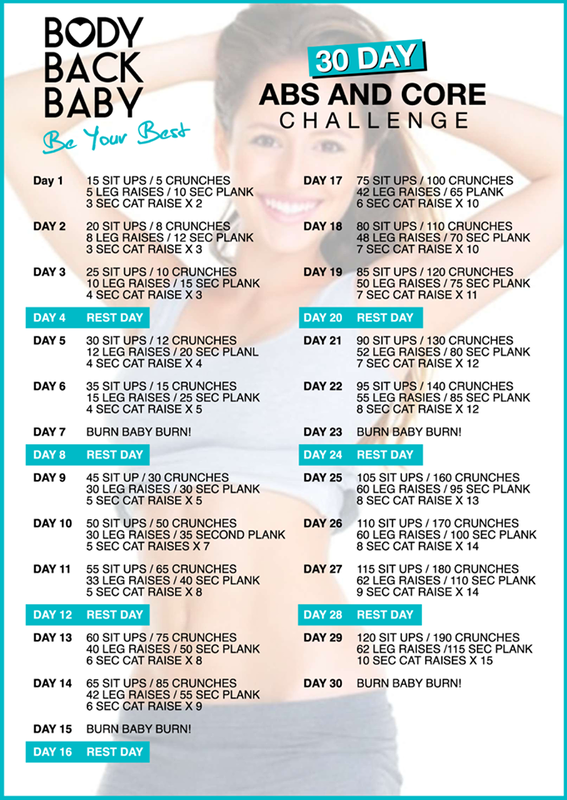 With this goal in mind I came across the Body back baby 30 day abs and core challenge. I have blogged about my attitude towards my physical appearance before and it has never been a high priority in life for me to be a size zero however as I would appear to be the target audience for this particular challenge I thought I would give it a go and if nothing else it will be a fall back topic for my blog over the next 30 days as I can provide updates about my progress. So bring on the rock hard abs and athletic body I am told I want by all the celebrity magazines. If you want to check out the challenge you can find the details on facebook.